I am uncertain how the great adventure started, but Justin (the main contractor working on the Cross House) and I were walking through the house, going over various issues, when our discussion unexpectedly veered toward sleuthing. Don’t ya’ love it when that happens? For no particular reason, we were standing in front of an exterior door in the dining room when the conversation veered. In 1929 when the Cross House was converted into apartments on the second floor? The owner, Scott Mouse, Sr., lived on the first floor. From what I can tell, the family converted the dining room into their living room. Perhaps the window was changed to an exterior door so that the family could have a private entrance, as the main entry was now be used by the apartment tenants? In 1950 when Scott Mouse, Jr., converted the house into the Palace Motel? In 1960 when the house was purchased by the Tom family? 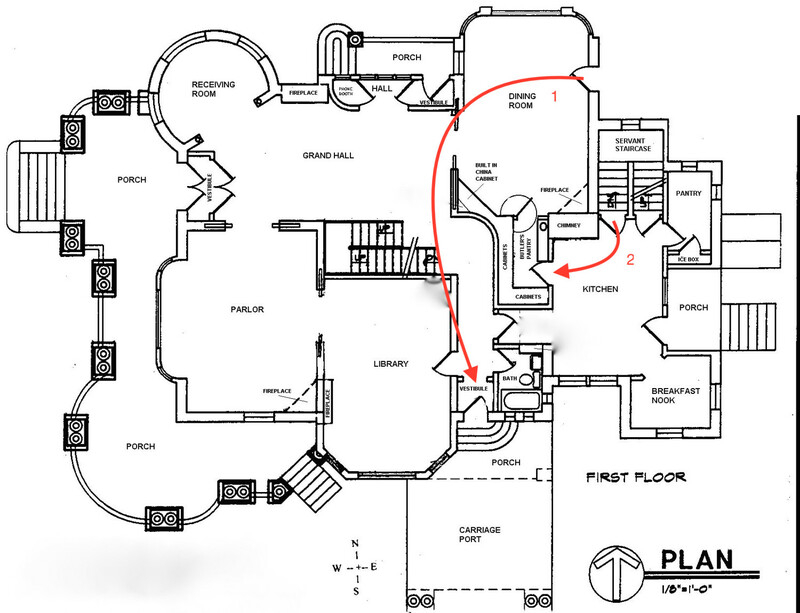 It has been confirmed that the family occupied an L-shaped suite comprising the dining room (used as a living room), the kitchen, and library (used as a bedroom). Perhaps they converted the window into a door to create a private entrance? It has a full exterior door “kelp” hardware set by Yale & Towne. Huh? Huh? 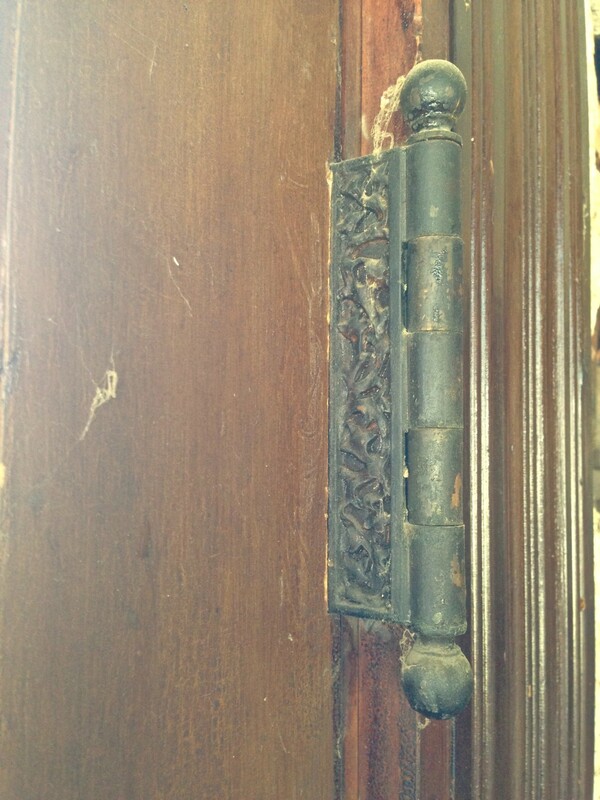 All the exterior doors on the house have the “kelp” hardware. But not the interior doors. And I was not missing any exterior doors. 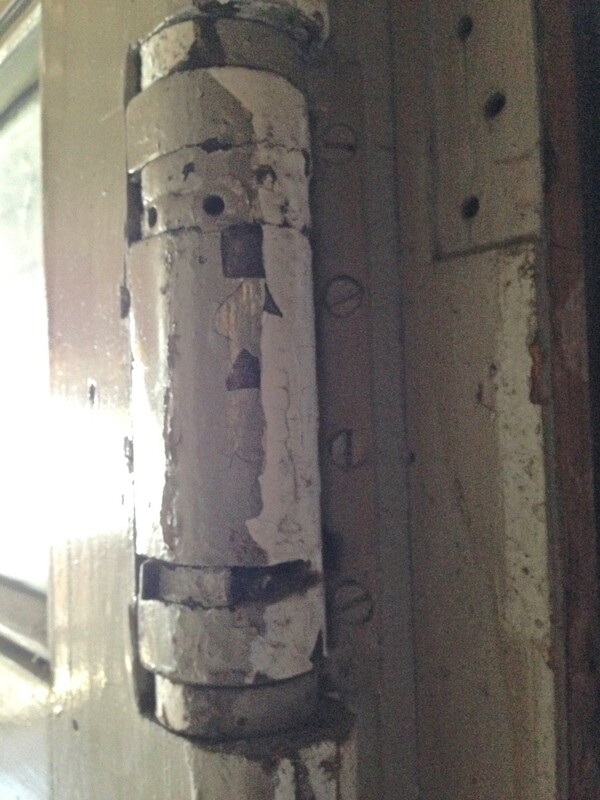 So, why did THIS door have an exterior door hardware set on it? The door had a large clear glass panel. 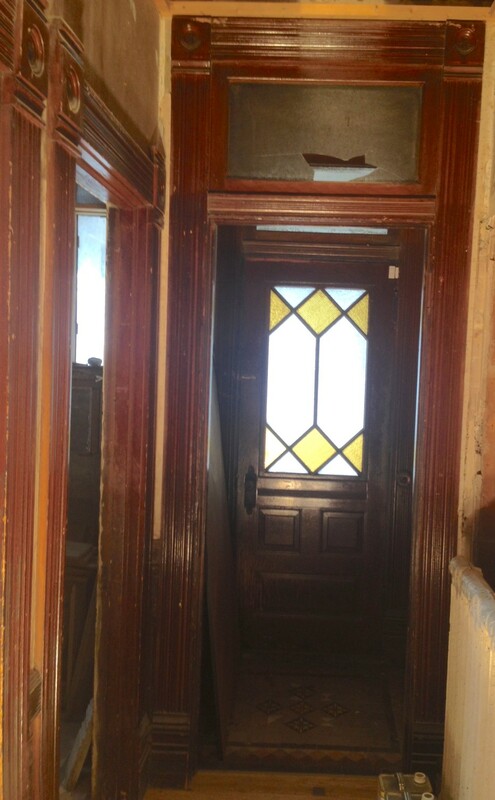 I had always assumed the door was altered when it inserted into the dining room, and that a paneled interior door (of which I am missing several) was altered by removing the upper wood panels and infilling with glass. The door. It had obviously been cut down top/bottom, and awkwardly fitted into what was originally a window. 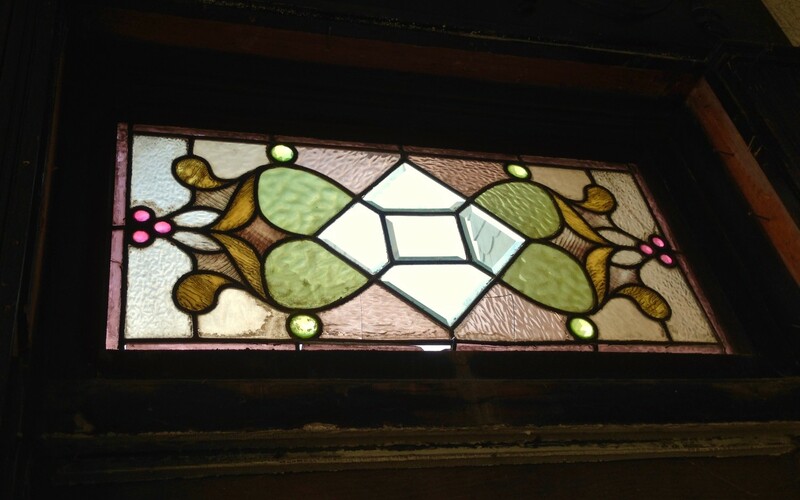 When the window was converted to a door, the wainscot panel was removed, and placed ABOVE the door, covering up this stained-glass window. Oh, the horror! Uncovering the window was something I did five minutes after buying the house. The “kelp” Yale & Towne hinges. These are ONLY on the exterior doors. But if I was not missing any exterior doors, WHERE was this door originally?????? Justin and I were vexed! We walked around the house looking for where the door was originally. I knew I was missing two first-floor doors. One was between the butler’s pantry and kitchen. This seemed the obvious location. Seemed. But the size did not fit. The other missing door was between the main pantry and kitchen. But, again, the dimensions did not mate. Argh! Justin and I stroked our handlebar mustaches. I then started thinking about the four entrances to the house. Three were used by the family, and have outer and inner doors, creating vestibules. As we walked around, I realized that the inner doors all have “kelp” hinges, too. Was I missing an inner vestibule door? I was! I just never noticed before! This south entrance was the primary family entrance, and it has an outer door (extant) and inner door (missing). The outer door has “feathered” glass, and golden glass. Above the door is a transom window of feathered glass. I then realized that the inner door…was missing! 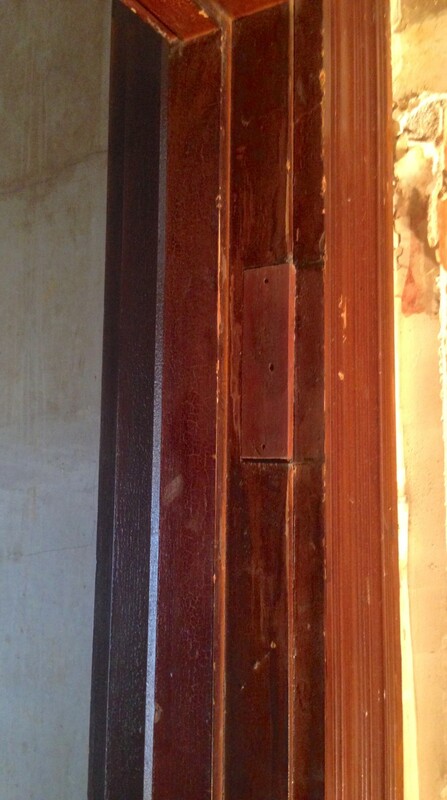 You can see how the former hinge locations of the inner door have been infilled with wood. This area of the house is dark, so this alteration is not normally visible. I had to hugely brighten the image to even show you! Above the door opening is another feathered glass transom. Justin and I, now rather excited, ran back to the dining room, measured the door and its hinge locations, ran back to the vestibule, and, wow, incontrovertibly knew that THIS is where the door was originally!!!!!!!!!!! So, too, was the presence of the “kelp” hardware set explained. But what about the big clear glass panel? The inner door MAY have originally been all wood. The north entrance has a solid inner door. So, we returned to the dining room door, took off the wood trim holding the glass in place, and expected to see the tell-tale signs that the door had been altered. But no such signs existed. We took off more trim. Still no signs. None. Not even a hint. Thus, we deduced — deduced! — that that the glass panel had always been there. Well, that does actually make sense, as this would have offered natural light into the dark hall. But was the glass itself original? I doubt it. It makes more sense that the glass would have matched the feathered glass in the transom windows, and outer door. So, Justin and I smoked our pipes in deep satisfaction. We have found the answer to a great mystery. All jazzed up by the adventure, Justin and I wanted more. We raced around the house, our capes flying behind us, in search of oddities, and stopped in front of a door in the kitchen, leading to the basement. In the NE corner of the kitchen is this attractive set of triple openings. I love grouped doors sets; don’t you? The door to the right enters the main pantry. This door is missing. The middle door goes UP to the servant’s stair. The door on the left goes DOWN to the basement. This latter door is the mystery. Note how it is not quite tall enough? Why does it have glass? Why does it have swing hinges? The swing hinges. 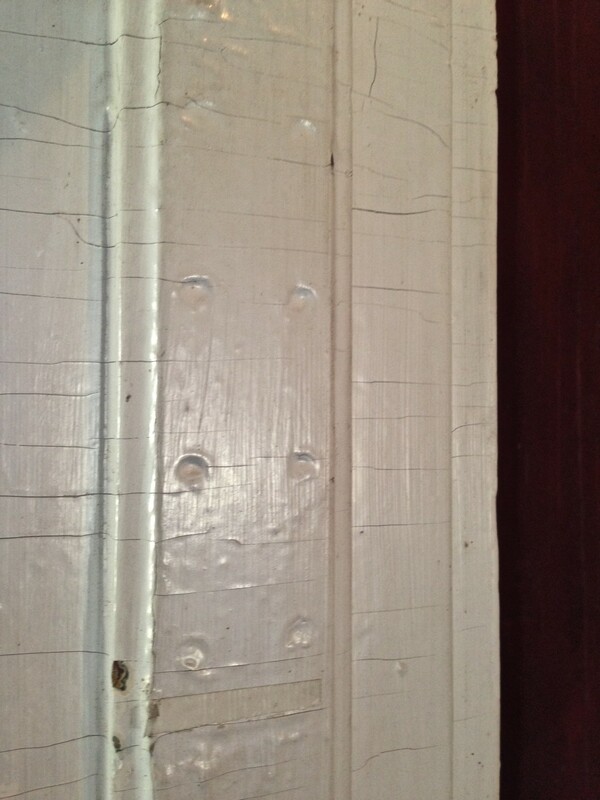 On a door which cannot swing due to original trim blocking any swing to the basement. …to, zounds, eight filled-up holes! This is the opening between the kitchen and butler’s pantry. Well, OF COURSE such a door would have had swing hinges, as does the extant door between the butler’s pantry and dining room. But why the glass panels? I can understand the two vertical panels, so that a person pushing the door IN would not bash into another person pushing the door OUT. They could see each other. But why the upper horizontal glass panel? Justin and I scratched out heads. Elementary, my dear Justin, elementary! Justin and I resumed smoking pipes in deep satisfaction. We have found the answer to a second great mystery. The original locations of Door #1, and #2. I will of course return both doors to their original locations. Now we were REALLY jazzed up! With capes a-flying, we raced around looking for more secrets our brilliant minds could reveal. And we stopped before the sink in the butler’s pantry. I had recently done a post on the pantry, and its copper sink. So, what Bo said preyed on my mind. HAD the sink been nickel-plated originally? Justin and I stared down at the small sink, as if willing it to spontaneously reveal nickel under the copper. We both turned on our iPhone flashlights and pointed them at the sink. The color WAS the same. This meant that my copper sink was not copper, but simply painted a coppery color! Who knew! Justin and I felt good. Damn good. We ended the day sitting on the front porch steps, our capes pulled close for warmth, and finished smoking our pipes. What you refer to as “feathered glass” is correctly called “glue chip glass.” I used to do stained glass, and this type of glass is still available. If you move the kitchen to basement door back to the butler’s pantry where it began its life, the glue chip glass would look good there too. I made up the name “feathered glass” because I had no idea what this type glass was actually called! 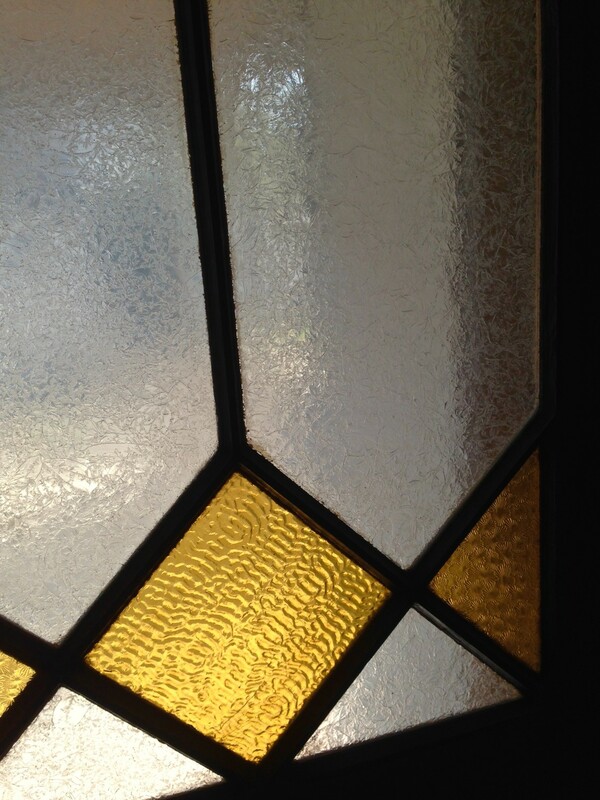 My plan is to return glue chip glass to the south entry inner door. But I will bet though that the clear glass on the pantry door is original. It would have been vital for people on each side of the swing door to see each other. Imagine the many accidents if not! Great detective work. So, is that copper under the nickel plating on the sink? Were all the secondary doors originally painted? Will you strip them down to repaint, or stain and varnish? I am uncertain what the original finish on the “copper” sink was. I am hoping that Bo will know. Yes, it appears that all the secondary doors (service areas) were painted originally. The door between the butler’s pantry and kitchen would have been, likely, varnished on one side, and painted on the other. Who paints a sink? The same sort of infidel that paints glorious, original-finish woodwork. Or shellacs it. I shall be on the lookout for deerstalker hats for you and Justin. You will look dashing in them! That is so cool Ross. When I first saw the pictures of the pantry sink I thought to myself that it looked like it was the same color of the walls not like an old copper penny. Well you uncovered many mysteries that have happened over time. I loved everything about this post! As if I was racing through the house with you to make these discoveries. Completely fascinating. ZOUNDS! As a grandmother of a 9-year-old grandson…I envision you and Justin racing around like he does! You are both Superheroes in my book! Loved this post! I wanted this post to never end!! How fun! This post made me smile, a very great satisfied smile. What a lovely adventure! I think this is my favorite post! I was excited to read what you found next. How lucky you are to have these mysteries. I can’t wait to read and see what else you find. Ross, you couldn’t make up stories better than your real ones. On the sink, take a look in the Wolff or Mott or Meyer-Sniffen catalogs (or others perhaps) at Internet Archive and see if you can A) find a similar pantry sink, and B) find a description of the material. 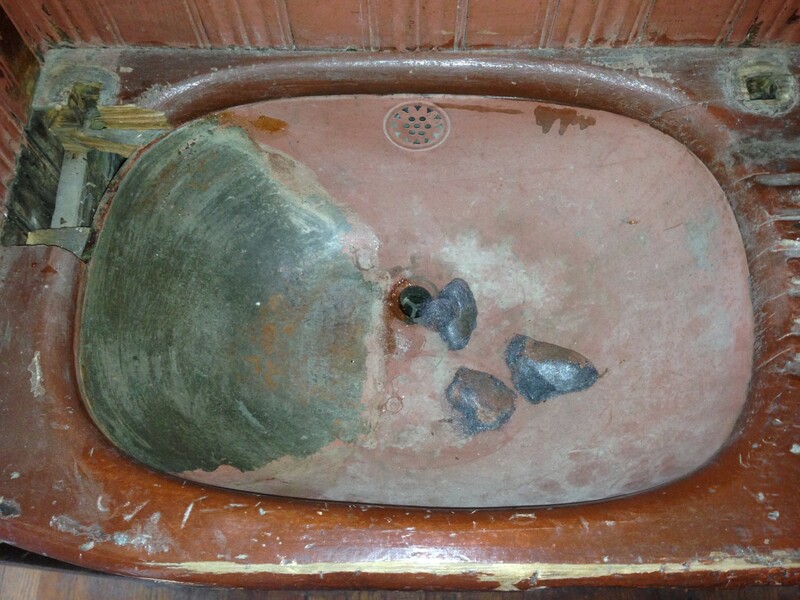 My understanding is that sinks like this were either nickel-plated copper, or a material called “German Silver” or “nickel silver” – often referred to as Monel metal today. If nickel silver, the color will be the same all the way through. If copper, the plating will wear to reveal a different color underneath – and it could be replated. Interestingly, a proper plating process – for instance on brass or steel – always lays down a layer of copper first, then a layer of nickel, then a layer of chrome on top (chrome finishes don’t come in until the very end of the 1920s and have no historical place in a pre-Depression home). The reason this is useful is because sometimes you need something in nickel but it is only available in chrome (I’m talking to you, Chicago Faucets). If properly plated, you can reverse the process and strip off the chrome to reveal nickel underneath – much cheaper than plating in nickel. My second comment is simply to caution against jumping to the conclusion that the vestibule door had glue chip glass in it and the current glass is not original. Both may in fact be true, but where is the evidence? 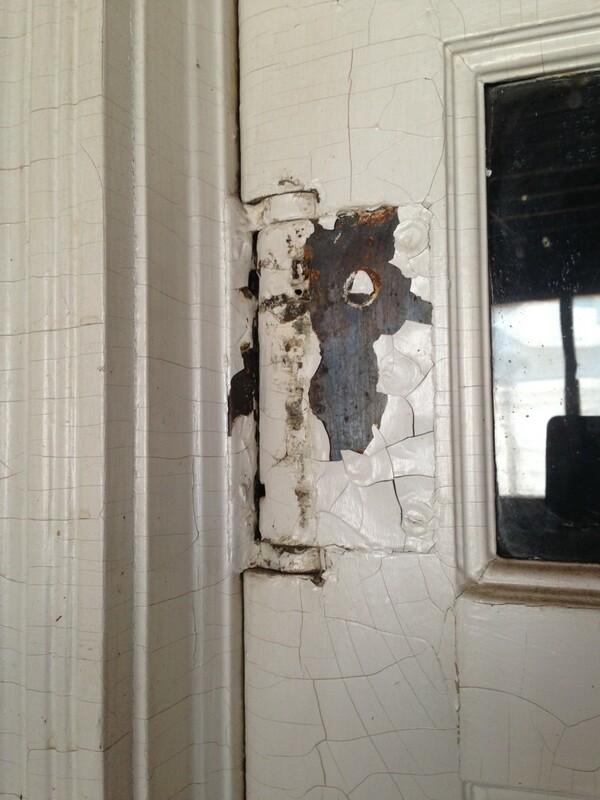 The glue chip was an obscured glass that gave a sense of privacy to the exterior door. However, there is no reason to believe that the same privacy would have been desired for the interior door (just as your beveled lites in the front inside doors are clear). P.S. Glue chip glass is fascinating, by the way, and was produced in a number of highly sophisticated techniques and processes, including double glue chip. Thank you for the long and wonderfully detailed comment! I did wonder that the current glass might be original. But the fact that the transom window above is glue chip glass (where privacy is not an issue) makes me think that the door below likely had the same glass. I mean, it would look odd to have X glass in the transom, and Y glass below, right? That is a very fair point – I can’t see that transom very clearly in the photo. It would be a bit odd to have X and Y glass I suppose, but at the same time, I could see how it might happen – after all, the lower lite would let in light from the outer door, but the transom (at least from the inside) would just give you a nice dark view of the ceiling. The effect of the glue chip in the transom is actually quite positive from that perspective. It also seems a bit odd to be in that vestibule space in an obscured glass sandwich. We may never know. In the realm of speculation, it is easy enough to rationalize and of a number of different stories. I take it there are no clues as to pattern language in the other vestibule doors? I do love a man who uses words like “pattern language”. 1) Main Entry (west). A pair of outer solid wood oak doors. An inner pair of doors with clear beveled glass in an elaborate mosaic. 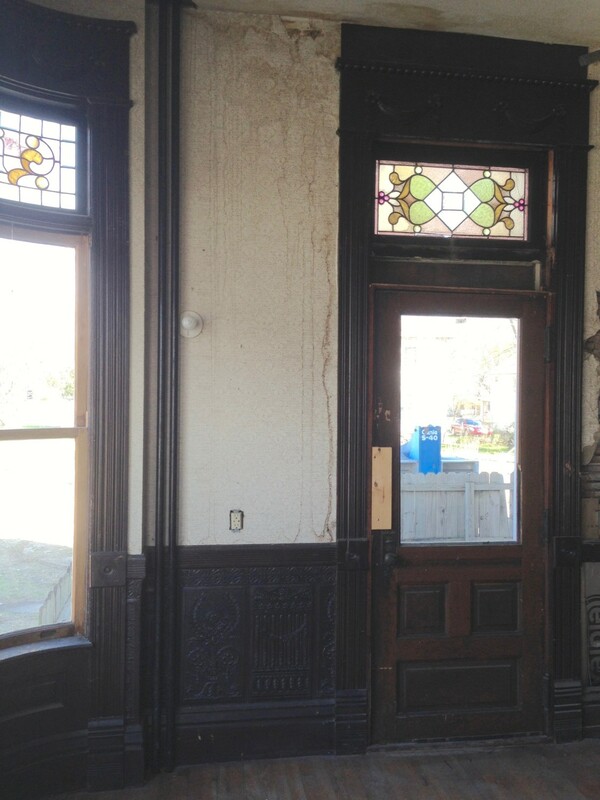 Both set of doors have stained-glass transoms. 2) North Entry. A single solid outer door. A single inner solid door. 3) South Entry (pictured above). A single outer door with chip glass and gold glass. A chip glass transom above. A single inner door with a glass insert. This door is discussed in the post above. A chip glass transom above. So, each entry has a different pattern language! What a great post! And I got a wee peek at the main pantry – I love the pantries and China cupboards of old houses. –It makes sense for the inner door to have had obscured glass. It leads to a family/servant area that should not be viewed by visitors in the main hall. –I still think the pantry sink was not as fancy as others believe. I think it is most likely the galvanized tin/zinc/steel like they used for the old metal bath tubs, etc. It is set into a wood counter, which–while very cool–is hardly top notch material. If the counter were marble, I might believe a slicker sink. 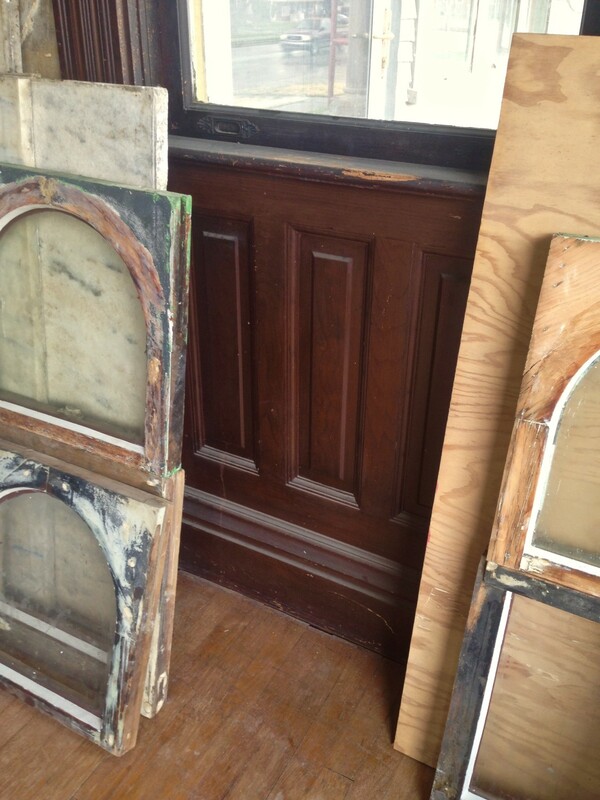 –The whole mystery and intrigue of figuring out these puzzles is one of the best parts of restoring an old house. Sherlock and Watson, you are a credit to the profession! Very exciting! 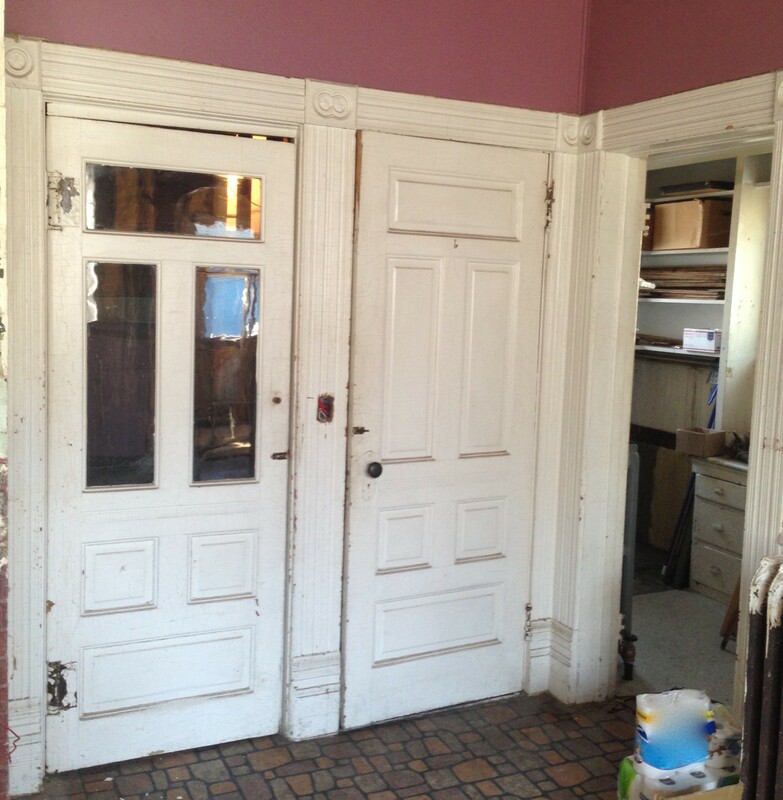 I agree; the detective work is half the fun of restoring an old home!